Pansies - the old-fashioned favorite flowers that are always popular. Tulips are known for their bold colors and beautiful shape. 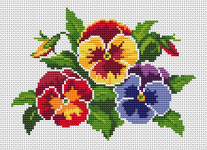 Spring flowers loved by many people.This cross stitch pattern is very suitable for cards making. Decorative blue flowers.An easy to do cross stitch design suitable for beginners. Still-life with pears on a shelf.Perfect for decorating kitchens and dining rooms.Say Hello to these fruity little friends! Small design of a purple crocus - one of the first flowers to emerge in the spring. Two daffodils or narcissus.One of the first flowers of spring. A flower cannot blossom without sunshine, and man cannot live without love. 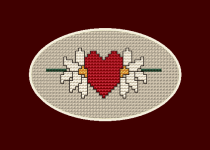 Oval card cross stitch pattern for Valentine's Day with two flowers and a red heart - the symbol of love. Simple pattern of a yellow tulip and yellow border.For cards making we recommend 16 or 18 count fabric white.